Let’s be honest, you’re probably pegged to the couch anyway, so now is as good as time as any to check out this quick blog post. Here are the new additions to Ziflow’s enterprise online proofing solution in this month’s release. With Automated Late Proof Reminders, Ziflow ensures your team members are always provided reminders to take action before a proof becomes late. 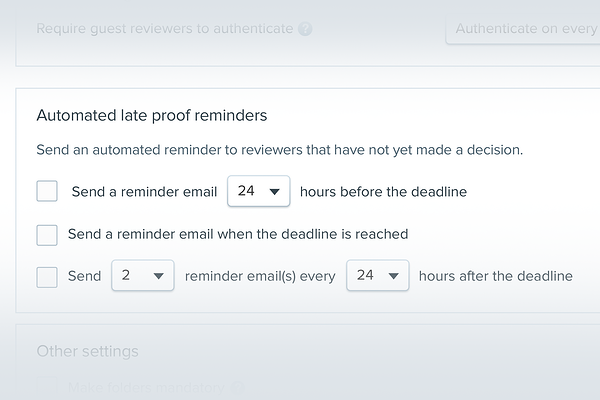 You can now configure account-level defaults to automatically send reminder emails to reviewers before, on and after the proof deadline date. Our product team has been very busy adding further enhancements to improve the reviewer experience when reviewing proofs. Now you can quickly switch between proofs residing in the same folder from within the proof viewer. This is great for campaigns which include different media formats (video, static, rich media, etc.) which need to be reviewed together. New proof viewer layout options. 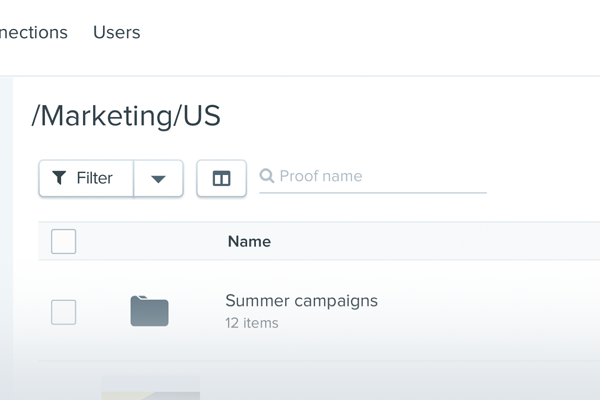 Users can now customize their proof viewer experience on a proof by proof basis. We’ve added options to toggle the comments displayed from the standard comment view, to a comprehensive list of threaded comments, to viewing comments one-at-a-time. Dark mode. 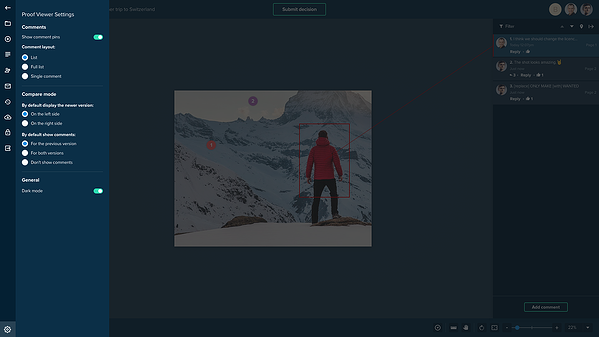 For those who prefer the benefits of dark mode, we’ve added this capability in the proof viewer. During our testing, our team members reported improved contrast and better readability of text. Compare mode swap. Now you can choose which side the newest version appears when doing a side-by-side comparison of versions. With our last release, we enabled reviewers to belong to multiple stages of a proof and Workflow Templates. 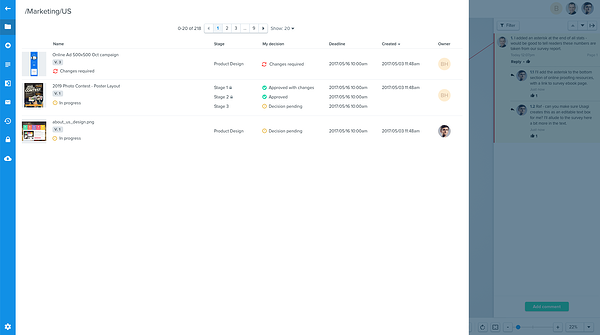 With this release, you can now add the “Proof Owner” to multiple stages of a Workflow Template if they need to collaborate across teams, or if their decision criteria are required at various points in the workflow. For customers with enterprise Zapier accounts, we now have a Ziflow Zapier app available, via invitation. For more information on that and to request access to the app, please contact your Ziflow customer success manager. 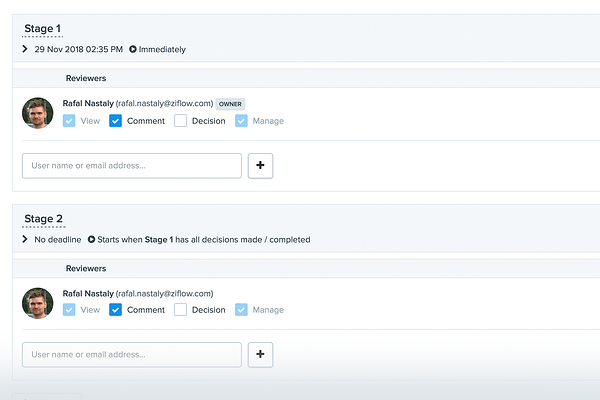 For our customers and partners embedding Ziflow in their larger workflows, we’ve added a few new enhancements to our API. For more information on our API, please visit our API documentation here. These new capabilities are live in the product now. Customers and those taking a free 14 day trial can start benefiting right away! If you haven’t already, you can request a free trial by clicking through below. Check out a free trial of Ziflow!